Sinfonia was founded in 1973 by Graham Bennett who conducted the orchestra for the next 17 years. Graham's avowed aim was to bring together the best amateur musicians in the area and to weld them into a chamber orchestra with professional standards of performance and presentation. David Greed succeeded Graham Bennett as Musical Director and Principal Conductor in 1990, and has encouraged the orchestra to broaden its musical horizons and grow in order to play some of the larger symphonic works. In 2003 Dougie Scarfe, Opera North horn player and then Director of the Orchestra, Chorus and Concert Programme at Opera North, was appointed Associate Musical Director. In July 2012 he left northern England and the orchestra to take up his new position of Chief Executive of the Bournemouth Symphony Orchestra. In 2014 Anthony Kraus, then Assistant Head of Music at Opera North, joined the orchestra as the new Associate Musical Director. In addition to performing the standard orchestral repertoire, Sinfonia commissioned and performed new works by Philip Wilby, Arthur Wills, William Kinghorn, Lawrence Killian and Graham Lynch. It has worked with many eminent soloists including the pianist Michael Roll, the late Ralph Holmes (violin) and the Leader of the English Chamber Orchester, Stephanie Gonley. Its connection with Opera North, through its current Musical Director David Greed has given it an opportunity to work with a number of ON soloists including, in recent years, David Aspin (Viola), Sally Pendlebury (Cello) Colin Honour (clarinet), Andy Long (violin), Catherine Lowe (Oboe) and Murray Greig (trumpet). In addition, Sinfonia is committed to supporting young musicians and has featured the following over the last few years: Yuanfan Yang and Lara Melda (piano), Jordan Black (clarinet) and Sophie Rosa, Nathalie Shaw and Emma Oldfield (violin). 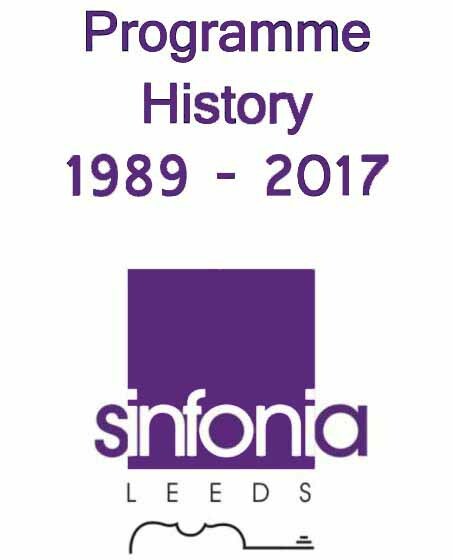 You can download a list of our concert programmes (as a pdf) from 1989-2017. We hope to extend the archive back in due course.